Cleaning and repairing the higher areas of your buildings has never been easier, all thanks to R.A.I.L. Rope access remains the most efficient and safe means of working at heights thanks to the minimal equipment and skill of our technicians. Not only that, with our help, you can save a lot of money – we are up to 80% cheaper than if you were to employ a scaffolding! We take care of buildings for all of our clients, larger and smaller companies alike. Over the years, we have offered many clients an incredible service, and we never deny a client our services. Whether you’re looking for someone to take care of a relatively small building or a 34-floor construction, we will tackle every challenge you send our way. 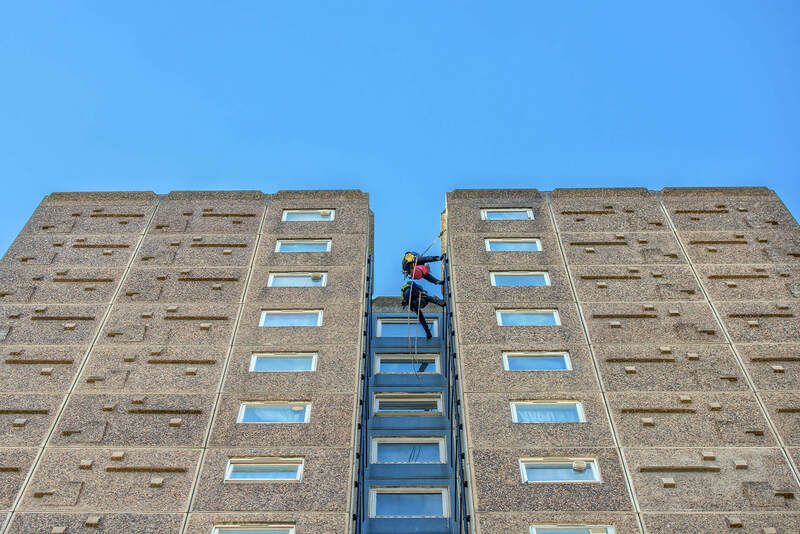 No matter how high your building is, you can count on our rope access specialists to provide you with a solid, thorough cleaning service, repairs, as well as any other task that requires working at heights. With our industrial abseiling experts, you can always be certain that the job will be done in the safest, most efficient manner.